This entry was posted on September 19, 2016 by Texas Safety Supply. If you have worked in a physically intensive situations like industrial work, sports, mountaineering or athletics, you must be aware of the benefits of powdered gatorade drinks. Since, we deal in industrial safety supplies, our main area of catering our services are to the industrial workers. However, a sportsperson or an average person who is engaged in any form of physical tasks can also take the benefit of the information provided in this blog. An industrial worker performs over a lot of parameters in order to deliver out something constructive. This is an ongoing process for each day of his work and neglecting the health and energy levels may cause various issues like lack of hydration, weakness and loss of protein and electrolytes in the body. But what still gets consumed a lot during the industrial work is water in the body. We all sweat when we work hard and something is definitely required to overcome that inadequacy of hydration in the body. A powdered gatorade drink is specifically made to achieve that energy and hydration levels by providing essential components like sodium, chloride, citric acid, potassium, bicarbonate, phosphate and calcium, etc. The hemodynamics of the body keep varying with the kind of work we do. It is highly essential to keep their functioning below or equal to the normal and any rise in hemodynamics may cause issues such as hyperactivity, nervousness and anxiety, etc. While working in industries, you tend to lose a lot of electrolytes and body chemical through sweat and a powdered gatorade keeps the levels balanced to replace those lost substances in the body. Sodium and Chloride are particularly important chemicals that should be maintained properly. Since a powdered gatorade is always consumed with addition of water in it, the capability to retain electrolytes becomes better. 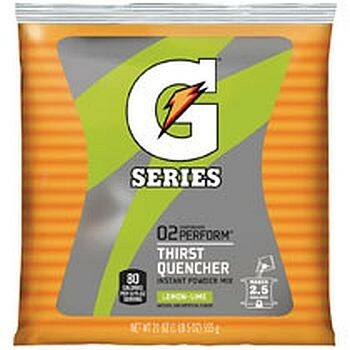 Gatorade helps water to get into blood more faster and effectively. The electrolytes in the gatorades get soaked up in your blood stream. Salt and sugar are the two substances that our body demands when it works out a lot. Gatorade contains both the glucose and sodium substances in it. The absorption takes places quite well and process of hydration happens better. The presence of sodium in the powdered gatorade causes you to urinate less and thus preserve the amount of electrolytes in the body for extended periods. A powdered gatorade can be easily carried in your bag or your vehicle and all you need is water and ice to mix through it. The powdered gatorade is available in multiple flavours and can be tastefully enjoyed too while having the supplemental benefits at the same point of time. These are readily available at our online store too. There are possibly no side effects of consuming the gatorade drinks but as a general rule of thumb, never consume much than required. An optimum quantity is something once or twice during your working hours. When you feel that you are losing out your hydration levels and energy to a large extent, it’s time to mix the powdered gatorade and keep going with the work. The common question that arises among the people is, how safe a powdered gatorade is. The answer is, if you consume a considerable amount of gatorade, you are always safe to go. Even the sports persons are allowed to consume it during their performance hours in various sports. Misusing it is never recommended and it is highly important to understand that it is not a source of gaining the power or energy but to maintain the energy levels and essential body chemicals to perform smoother throughout the task. Contact us for your powdered gatorade requirements through our website or call us at 214-764-3527 for a quick assistance.